For some inexplicable reason, some changes in the configuration keys appeared for all the custom levels I have in my PC, and I'm not able to change the setup to restore the default options and, of course, play more levels. Please, where is the config archive for the default settings? In Windows up to Win7 (assuming also Win8?) those are also stored in Windows's own registry. ■Start -> Run -> type regedit. In Windows7, it then asks if you want to continue with admin rights : yes. 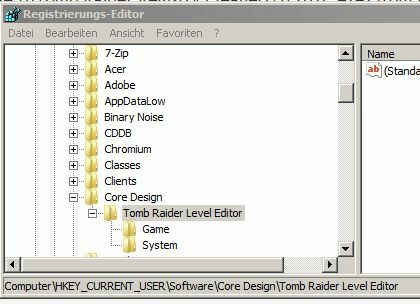 But - first exporting or not, the important thing is : Delete the Tomb Raider Level Editor folder within Registry editor. Then quit the registry editor. Windows has now "forgotten" all its settings that were used for TRLE games, so everything TRLE is back to defaults. When you now start a tomb4.exe the setup should automatically pop up. Pick your choices, and remember : NEVER "cancel" the setup! Thank you very much, snork! I've deleted that entry in the registry and all works OK now. Now I'll be able to finish the walkthrough I'm writing. I know this is not related to the particular subject, but I really advice everybody to buy the most simple controller.It's like 80% easier to play and there are no technical problems. How do I get to setup screen? I'm playing The Discovery and want to change the setting to the read me. 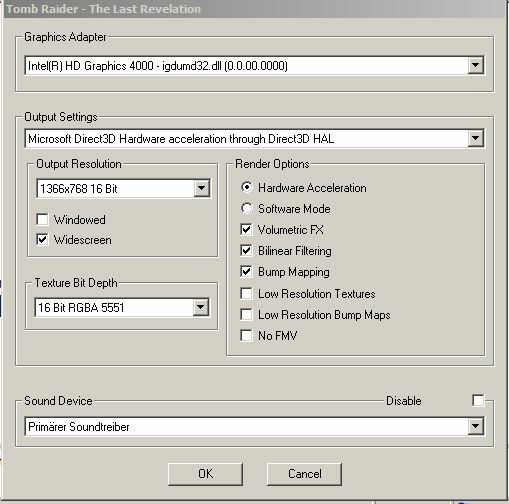 and add setup in the box there are named destination after tomb4.exe"
I used his because I don't have tomb4.exe in regedit. Would it be safe to delete the level editor and reinstall it maybe?